The Canadian group that controls a fifth of global potash wants to buy K+S for over 7 bln euros. Success would give Potash Corp its German rival’s new Canadian mine and more pricing power. With a Russian cartel in flux and BHP also a threat, the move looks defensive. Chris McKay, supervisor at the Cory Mine, examines potash inside one of the storage facilities near Saskatoon, Saskatchewan October 10, 2013. Potash Corporation of Saskatchewan said on June 25 it had made a “friendly proposal” to acquire Germany’s K+S Aktiengesellschaft (K+S). 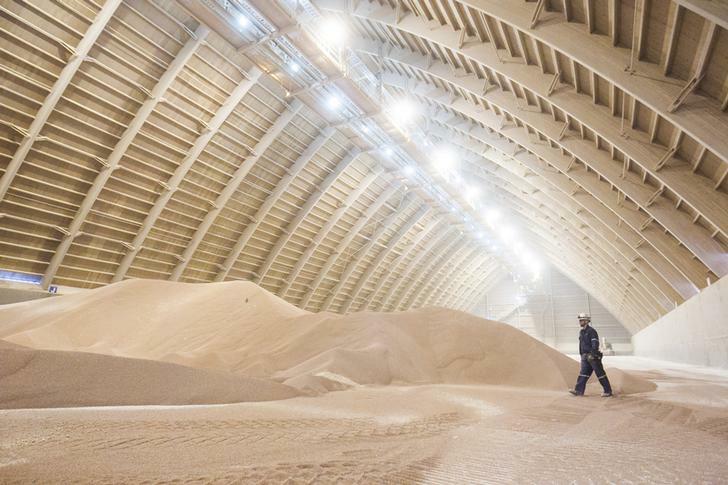 Potash Corp said there was no certainty that any offer would be made and did not disclose the offer, but a person familiar with the situation said it was approximately 41 euros a share, valuing the group at over 7 billion euros. K+S said it was currently assessing the available options, and that the process was still ongoing. Shares in Potash Corp closed up 5 percent on June 25 at $31.89. Shares in K+S were trading at 36.7 euros, up 26.3 percent.